It would be a dream if you could live your life doing exactly what you wanted, all the time, and you could comfortably, happily, profitably survive doing nothing else but that. Unfortunately, reality isn’t like that, and most entrepreneurs already know this. But if most understand this basic, uncontroversial fact, why do I still keep hearing a damaging piece of advice being spread among entrepreneurs like a bag of candy? If only this were true – but it isn’t. Following this piece of advice is never going to reveal how to make money, and believing that it is can be damaging to both your career and your self-development. Do you disagree? Let’s break down what I mean. In my experience, the people most likely to suggest that money automatically comes to you when you focus on your passions are either a) billionaires, or b) people who don’t know how to make money themselves. First off, anyone who has already made enough money to be a billionaire probably doesn’t remember what it was like to have made their fortune in the first place. By this stage of their careers they will have forgotten many of the sacrifices, the compromises and the difficulties they had to overcome while getting there. As for the people who don’t know how to make money and don’t have a great deal of money, they often have a “hippy-ish” viewpoint. They label happiness as the most important thing in the world, and claim that doing exactly what makes you happy is more important than making and managing money, or they suggest that money will automatically come to them by doing what they love. Neither of these groups of are composed of people whose views you should value when it comes to advice such as this. The quote, “Do what you love and the money will come to you,” is, at its core, about having passion in your work. While I agree that this is essential, like everything else in life the division between your passions and how you make money is about finding a balance. Too much passion, and you restrict yourself to a narrow job market and probably a low rate of pay. I have a lot of hobbies that make me happy in the real world, like my music, sports cars, and spending time with my family. While they may contribute to my self-improvement, I’m not going to make money from any of these things, though. Even if I could make cash by listening to music as a reviewer, what would happen when they sent me music which I don’t like to review? What am I going to do, quit? Hardly a great path to self-improvement. On the other hand, without enough passion you’ll end up in a dead-end job, feeling like you are a soulless drone who has sold out and is not going anywhere. The reality is that, no matter what job you do, you are going to face challenges, frustrations and difficulties, and it’s up to you to face them with positivity and persistence. Passion can drive your career, but your focus needs to be on the money you are making. Your income MUST take priority over your passions, but that’s okay. Unfortunately, there is a lot of shame, guilt and fear when it comes to the idea of focusing on how to make your money, as if it makes you greedy, shallow or even evil. I’ve put a lot of time into trying to smash this lie to pieces, and letting peers and people across my network know that it is an inaccurate load of nonsense. Without even mentioning the possibilities that having money creates for philanthropy and charitable donations, it’s also money that allows you to treat your family to trips abroad, to put your children through college, and to treat your employees to a fair wage that shows them that you value them. Why would you be embarrassed about that? Happiness does often accompany money, because if you invest well, build your assets and devise reliable ways to create passive income, you will find that you have more time for the things you love. But managing your finances is a skill that is just as significant as those you use to do the job itself. Managing your money is a key skill to be in your self-development priorities alongside eating well, living healthily, and being a good person. It is a skill that you need to practise and nurture, to improve your understanding of it and to pass on to your children. When the economic climate changes you must be able to thrive rather than flounder in such conditions, so you must learn a variety of ways in which to make your money. The world alters frequently and often financial change comes with it, but if you manage your money successfully, attain lucrative assets and develop passive income, then you will always be in a good position whenever life takes a turn. You will always be ready to look after yourself, your loved ones, and your business, which are all important routes to self-improvement and success. If you make enough passive income to cover your overheads and eventually leave your job, you will also find that you have more time and more spare cash to enjoy your passions that don’t make you money. Essentially, you should do what you love and focus on your money, so that you can do what you love for longer. Comments, suggestions, questions and feedback are as welcome as ever! 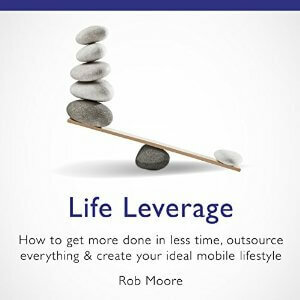 If you want to learn more about how to look after your money, progress in your career, leverage the things you dislike and do more of the things you love, find my book Life Leverage here.